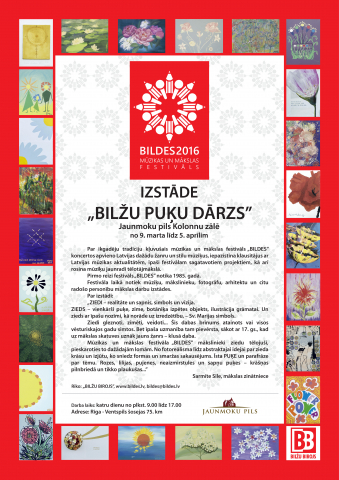 While waiting for spring, the LVM Junmokas Palace has opened an exhibition “BILŽU puķu dārzs” (flower garden of BILDES), which consists of flowers presented in paintings, drawings and in other techniques – in artworks created by musicians, artists and creative personalities. Exhibition can be visited until the 5th of April. Flowers painted, drawn, made... This miracle of nature is portrayed in almost all historical times. But a special attention has been paid to them starting from 17th century, when a new genre comes in the spotlight – still life. “Artists of Music and Art Festival “BILDES” have portrayed flowers brightly and in various ways. From photorealism to abstract idea about the colour and sensation of flower, which has been made from the fusion of shape and fragrance. A real flower and a paraphrase about the theme. Roses, lilies, peonies, forget-me-nots and dream flowers – gorgeous in full bloom and while blooming. One exhibition has combined realism, partial abstractionism, symbolism, even Russian Constructivism. Exhibition is an interpretation of paraphrase about the Calude Monet theme, and we could find here more and more, and more details from our Līga Purmale”, how art historian, Sarmīte Sīle, has evaluated the works of exhibition, praising the professionalism of works. Artists and creative personalities: Visvaldis Asaris, Arvīds Endziņš, Dace Melbārde, Ināra Garklāva, Agnese Bērziņa, Ojārs Jansons, Laila Kocere, Līga Križevica, Inese Mailīte, Inga Pērkons, Indra Puķe, Arvīds Plokšta, Jānis Straupe, Maija Rezenberga, Ieva Rubene, Mārtiņš Rubenis, Laima Vanadziņa. The exhibition is organised by the Music and Art Festival “BILDES”.